Christmas is one of my favorite excuses to be creative. While I love the holiday decorating, I tend to be rather skimpish when it comes to paying money for what I consider ‘disposable’ accents, and so I work to craft my own using what I own and the nature in my yard. Last year for my birthday (it was a big one, saying goodbye to 5 decades, looking forward to more to come), my hubby showered me with flowers. They were breathtakingly beautiful, unique, and artistic, done by a local florist he knew he could trust to create arrangements outside the boundaries of 1800-florist. When their beauty had well past waned and out with the trash they went, I was left with unique and beautiful containers picked for specific areas, one of which being my parsons table. My parsons table sits behind my couch in-between the great room and the kitchen. It’s a big space and the vase is the perfect height , not too high, so I can see from the kitchen in to the family room, not too low as to be missed. For the fall/Thanksgiving, I filled it with lemons and mini-pomegrantes. 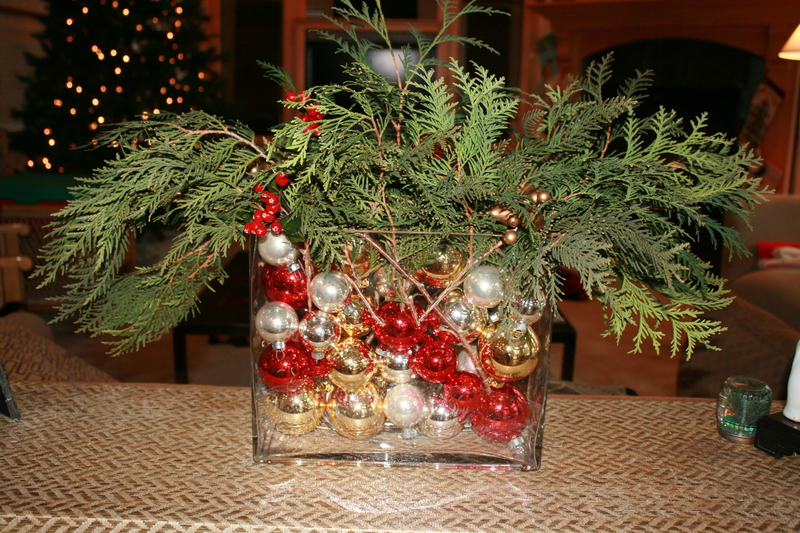 For christmas, I pulled out my vintage Christmas tree balls and headed out to my arbor vitae to clip some greens. A bit of decorative garnish and VOILA! I am pleased with the result: simple, colorful and not too flashy. A bit of greenery in the house to contrast with the stark barren brown leafless trees, and wintery white snow outside, brings inside a cozy holiday feeling. There is an abundance of nature out there, and any vase or cool container can be used to create a bit of festive holiday sparkle in any area of your own home. Just think out of the box and get snipping! It’s the day after Thanksgiving and all is quiet in the house. And while I love Thanksgiving Day, I love the day after even more. I get to sit in my sweats reading the news or a book. The kids are home, usually sleeping in till noon. Hubby walks the dogs for me. There are plenty of leftovers, so no real cooking effort needs to be made. Yes, it is the perfect calm before the storm: The storm of festive flurry we call Christmas. Thanksgiving has a gentle lead up to it. Mother nature does her part, slowing the cycle of life to a dormant state of rest. Plants and animals alike preferring to sleep through winter, to be awakened by springs breath, tickling them to awake. One is busy through Halloween, preparing ourselves for this time of ‘wintering over’. So, by the time Thanksgiving rolls around, attention can be focused on giving thanks, untouched by the other distractions so prevalent in spring and summer. Thanksgiving is the time of year families turn inward, reconnecting and cherishing each others presence. It is the time of year we seek out those who might not have the blessing of genetically related family, extending the hand of familial friendship, embracing new connections and relationships so that hopefully no one unwillingly spends the day alone. In our home, with the exception of my brother (who drives the long 4 hours in traffic) we don’t have our own extended family nearby. Instead, we have been blessed with amazing family friends with whom we have created our own traditions, and break bread with. Some years our little family has shared the occasion with three or four families, house bursting to the seams with laughter, conversation and joy. Some years it has been quiet and cozy, shared with one other couple or my brother, an emphasis on comfort and intimacy. All have been wonderful and wonderfully different. When Thanksgiving Day is over, it’s the perfect time for me to pause before mentally and physically gearing up for the chaos that todays culture has created, Christmas. We all try not to get caught up in a ‘keep up with the Jones’ attitude towards Christmas; but many of us have traditions we wish to keep. The result can be a self imposed pressure to fit all that we have individually defined as ‘Christmas Spirit’ into the Christmas season. Ideally, we spread the ‘reason for the season’ throughout the year. But let’s be honest, it is at least nice to have a time of year were we are encouraged and motivated by society and culture to be intentionally giving and sharing. And so we come back to Black Friday, a nightmare of consumerism, resulting all too often in the most base of behavior. It’s hard for me to fathom the very people who were sharing their time and table one day, embracing the concept of Thanksgiving, are the very same people mowing down their fellow man/woman in a mad rush to be the first at the bargain table the very next day. For those who work this day, I thank you for your patience and service. It can’t be easy to work on Black Friday, but with the demand for the stores to be open, someone must be there to open the doors and ring the cash registers. And ring they do. I’ll leave the thrill of the sale to others. I am going to sit here with my steaming cup of coffee and give a pass to the madness. As I read the headlines of the morning, history has been a good indicator of the present. I am reminded of an appropriate metaphor: Don’t feed the beast. So, I won’t. Instead, I think I’ll make a leftover turkey sandwich and be very thankful I am home.